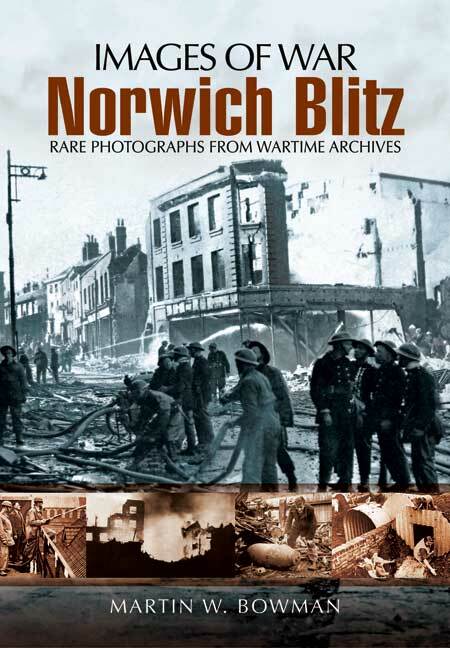 You'll be £14.99 closer to your next £10.00 credit when you purchase Norwich Blitz. What's this? Norwich, in common with most English cities, suffered enemy air attack and during a period of almost three and a half years bombs were dropped in every part of the city. The first German raid occurred on Tuesday 8 July 1940; the last on 6 November 1943. The total number of Alerts during 1943 was 95 with a total duration of 54 hours. The Crash Warning was sounded 50 times with a total duration of 19 hours 8½ minutes. There was no large devastated area but throughout the city considerable damage was caused. All sections of life were affected and factories, railway stations, shops, schools, hospitals and churches sustained damage and many buildings were totally ruined. Of the city’s 35,569 houses in 1939, 2,082 were destroyed entirely, 2,651 were seriously damaged and 25,621 were moderately damaged. In human toll 340 people were killed and 1,092 injured, over three-quarters of these casualties occurring in 1942 when the enemy carried out what became known as the Baedeker Raids upon Cathedral cities and historic and administrative capitals of the provinces.